Built to Last: FlowGuard Gold CPVC Resists Chlorine Degradation | Lubrizol Advanced Materials, Inc.
All plumbing system materials are required to meet certain performance criteria to ensure that the materials are suitable for use in a potable water supply. These requirements include performance such as temperature and pressure bearing capability and, for some materials, a time to failure measurement when exposed to chlorine. This chlorine resistance standard, ASTM F2023, is required for polyolefin plastics such as PEX, PERT and Polypropylene. For CPVC materials, such as those used in FlowGuard Gold plumbing systems, there is no requirement for chlorine resistance testing. What is ASTM F2023 and why must PEX be tested to it? In the early 1990s, the industry was rocked by massive failures in polybutylene plumbing systems, not long after there was another crisis caused by failing polypropylene dip tubes in water heaters. These failures could both be traced back to a process called oxidative degradation, which is caused when chlorine-based water disinfectants chemically attack the molecular structure of pipes made from polyolefin plastics, such as polybutylene, polypropylene, PEX and PERT. The molecular structure of these polyolefin materials will inherently fail over time due oxidative attack from chlorinated water. To slow the time to failure, manufacturers add chemical additives to their materials to inhibit chlorine disinfectants in the water. These antioxidants are “sacrificial” meaning that over time, they will dissipate leaving the original molecular structure vulnerable to chlorine attack and failure. Following these widespread failures of polyolefin plastics, ASTM F2023 was developed as a test standard to determine through accelerated tests and extrapolation how long it would take for a PEX pipe to fail due to chlorinated water. Unfortunately, the ASTM F2023 test cannot accurately reflect all actual use conditions, as a result the standard itself states that the extrapolated time to failure and actual time to failure of a PEX pipe could be different. To further support this limitation of ASTM F2023 testing, the Plastics Pipe Institute issued a technical note to explain the temperature, pressure and water conditions which could significantly accelerate the time to failure. Why doesn’t FlowGuard Gold CPVC have an ASTM F2023 rating? The molecular structure of FlowGuard Gold CPVC protects the pipe and fittings from the kind of chlorine attack that can cause PEX and PERT systems to fail. 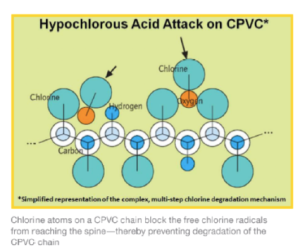 This is because CPVC is itself chlorinated; the large chlorine atoms that surround a CPVC polymer chain act as a guard, blocking the chlorine radicals in chlorinated water from reaching the chains. This protection comes from an inherent part of the molecular structure, since it is not an additive, the resistance to chlorine will not diminish with time and the system will not fail due to chlorine. Because FlowGuard Gold CPVC’s chlorine resistance is inherent in its molecular structure, CPVC materials are not required to be tested to the ASTM F2023 standard. In fact, if FlowGuard Gold CPVC were tested to ASTM F2023, it would be impossible to calculate a result due to this immunity to chlorine degradation. CPVC pipe and fittings are often used in aggressive chlorine-delivery systems that operate at chlorine levels several times greater than the normal level of tap water. CPVC is also used in delivery of industrial-strength bleach in paper mills and wastewater treatment plants. Free chlorine levels in these applications can be 40,000 times the level of normal pool water in these cases and about 2.5 times higher than bottled household bleach. CPVC is used extensively in the chlorine production industry for headers that collect the chlorine gas off production cells, plus the lines that carry depleted brine solution saturated with chlorine gas. If CPVC materials have withstood these intense, aggressive situations for decades, builders, plumbers and homeowners can be confident that FlowGuard Gold CPVC will never fail due to chlorine-based water disinfection.